Pro skier Cody Townsend keeping agile in the off season on the iconic Toads rock garden (Ben Fish). There is a trail in the Sierra Nevada that winds its way through mountainous areas on the southern shore of Lake Tahoe. Just over five miles long, the narrow trail meanders through some beautiful terrain with rocks the size of grizzlies and forests of pine trees with crooked postures. It rambles through the habitat of goshawk and spotted owls near Saxon Creek. During the latter part of the 19th century, cattle grazed in that area and used the 5.2-mile path to access the creek for drinking water. Over time it became known as the Saxon Creek Trail. Parts of the trail fell out of use in the first half of the 20th century because cattle operations decreased, and the needs and preferences of the locals changed. 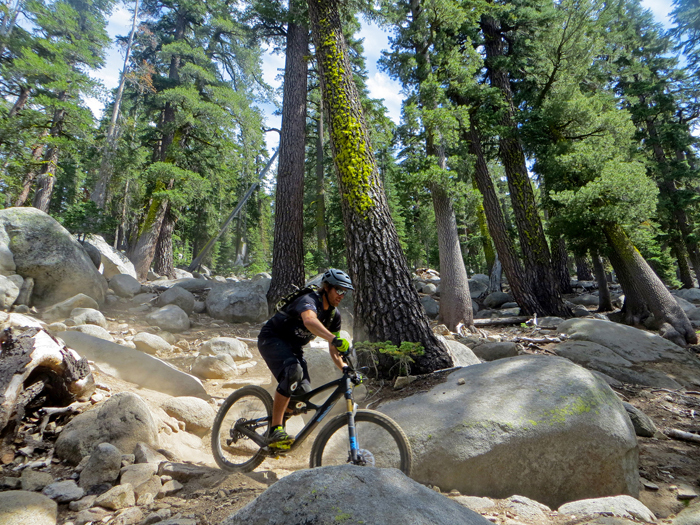 People started using the mountain trails on the southern shore of Lake Tahoe for recreation rather than ranching. The rugged 5.2-mile stretch near Saxon Creek was considered too rough and difficult for a mere walk in the woods, and few hikers and explorers used it. As a result, it began to blend into the natural landscape. In 1979, everything changed when Gary Bell and Gene St. Dennis began riding bicycles along Tahoe’s backcountry trails. Bell and St. Dennis were trying to discover connections between pieces of underdeveloped paths on which they could ride their bikes. 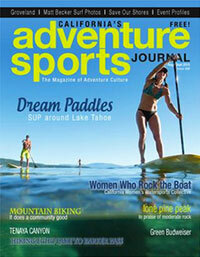 In researching this article for ASJ, I caught up with Bell in South Lake Tahoe. He explained that when they discovered the 5.2-mile Saxon Creek Trail, “It was nothing but a little game trail that took some work to ride down it. But we made it.” St. Dennis nicknamed the 5.2-mile trail Mr. Toad’s Wild Ride, after the Disneyland ride by the same name. It was the first time bikes were ridden on the Saxon Creek Trail. 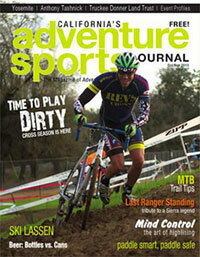 Mountain biking, as an official outdoor sport, was still in its infancy. Gary Bell on his original 1979 Lawwill Pro Cruiser mountain bike. Imagine riding this bike down a primitive Mr. Toads Trail nearly 40 years ago (Ben Fish). The re-naming of the trail (usually shortened to “Mr. Toads”), marked a pivotal time in the trail’s history. 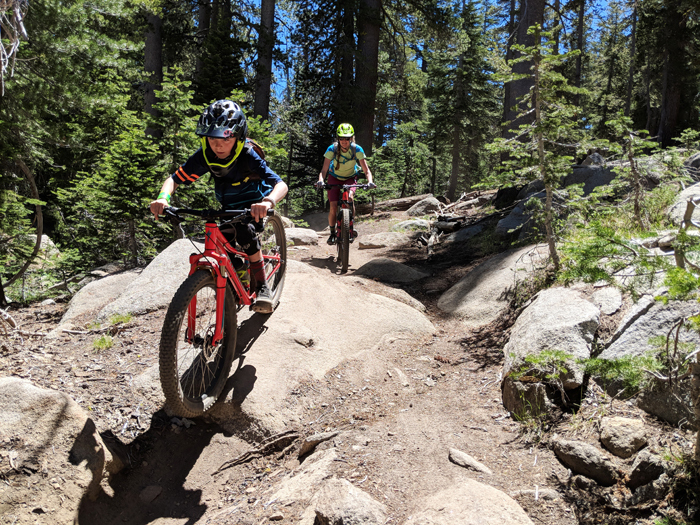 It was the beginning of a battle over how Mr. Toads and other trails on the southern shore of Lake Tahoe ought to be enjoyed. Some hikers did not like sharing trails with mountain bikers. While they considered a forest trail to be a quiet place, mountain bikers were enticed by the trail’s fast and rugged challenges. Mountain bikers pedaled hard and enjoyed the challenges of riding over gnarled tree roots and through complicated rock gardens. Some riders raced past without warning, causing a few hikers to complain. The mountain bikers pointed out that the trail was pretty much unused until Bell and St. Dennis revived it, but a few vocal hikers felt that nature should be enjoyed a certain way and bikes don’t belong on dirt trails. The Forest Service, whose job it is to maintain trails and their environs, sided with the hikers in the 1980s. Mountain biking was new, and from the Forest Service’s standpoint, relatively uncommon. There weren’t many people who rode bikes in the mountains and some considered mountain bikers a nuisance. 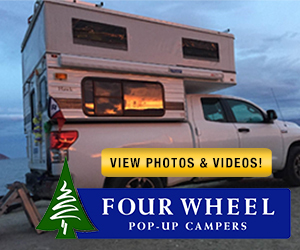 Hikers said that bicycles put a lot of wear and tear on the trails, while bikers pointed out that horses have a larger impact and horse packing is allowed in Wilderness areas. 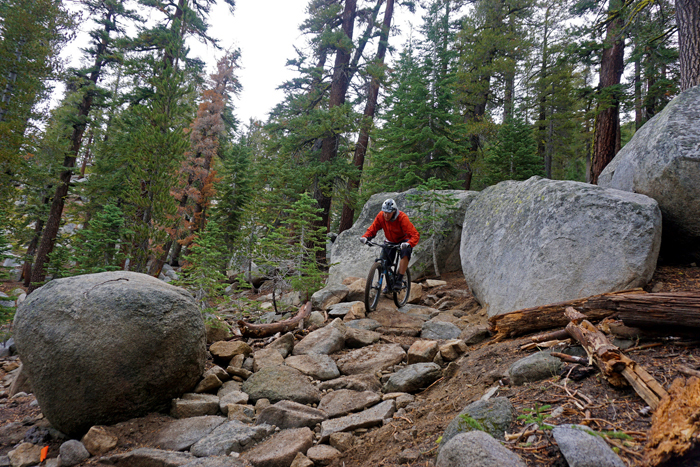 The Forest Service thought it easier to designate the region on the southern shore of Tahoe as a Wilderness area—a designation that excluded mountain bike access. 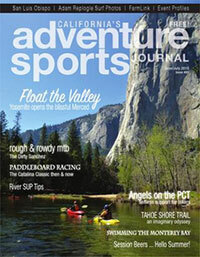 What the Forest Service was not expecting was the growing popularity of off-road bicycle riding in California. Bike races on Mt. Tamalpais, in Marin County, were attracting more riders each year. Participants modified paperboy bicycles to withstand the rigors of speeding down rugged dirt terrain. The media began covering these “Repack races” in 1978 and news spread about a new type of bike riding called mountain biking. 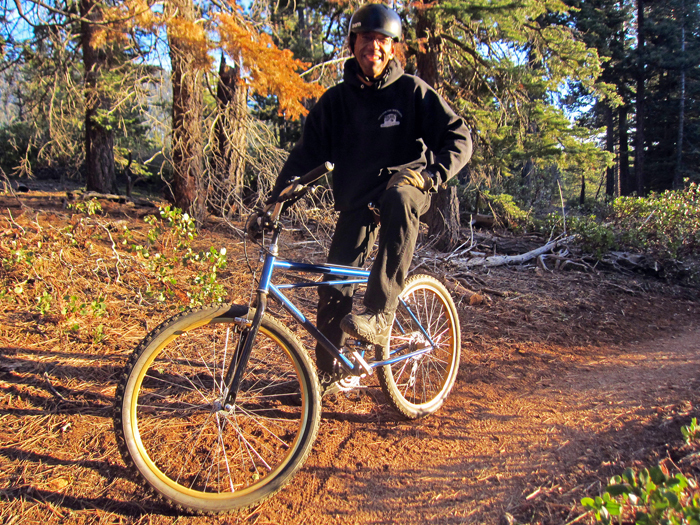 Bell and his friends rode these mountain bikes on Mr. Toads and other Tahoe trails. He knew the sport of mountain biking was attracting people. He also knew the Forest Service was serious about blocking trail access to mountain bikers, so he decided to take action. 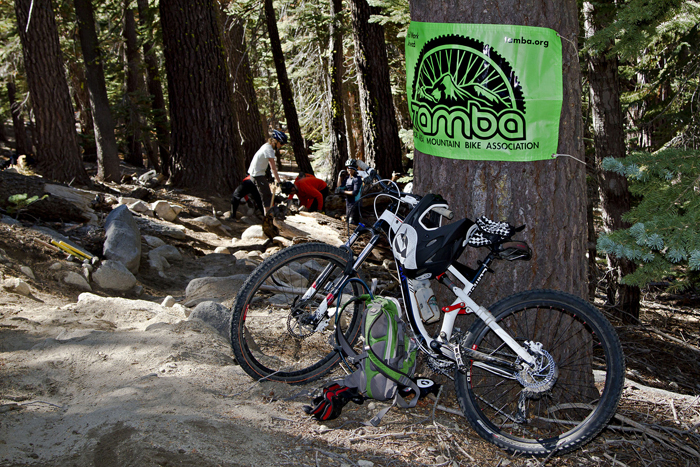 That year Bell helped form the Tahoe Area Mountain Biking Association, now commonly known by the acronym TAMBA. 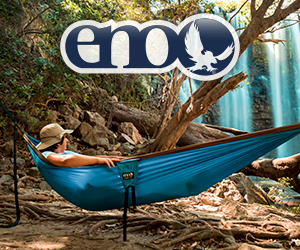 “If we were going to prevent the loss of trails, we needed to get people involved,” said Bell. Early TAMBA leaders wrote articles and passed out fliers to local businesses to get the Forest Service to change Mr. Toads proposed designation as a Wilderness trail. They organized work parties where bikers brought shovels and picks to Mr. Toads, and other trails in the Tahoe region, to conduct trail maintenance. Membership rose to 1,200 people at a time when there was no Internet or social media. 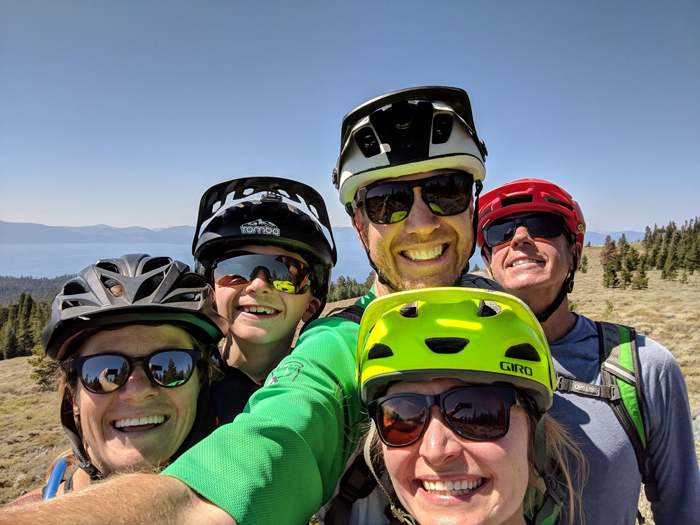 What TAMBA successfully demonstrated was that mountain biking was not only gaining in popularity, but that it was also a legitimate use of almost any trail in the South Tahoe region. 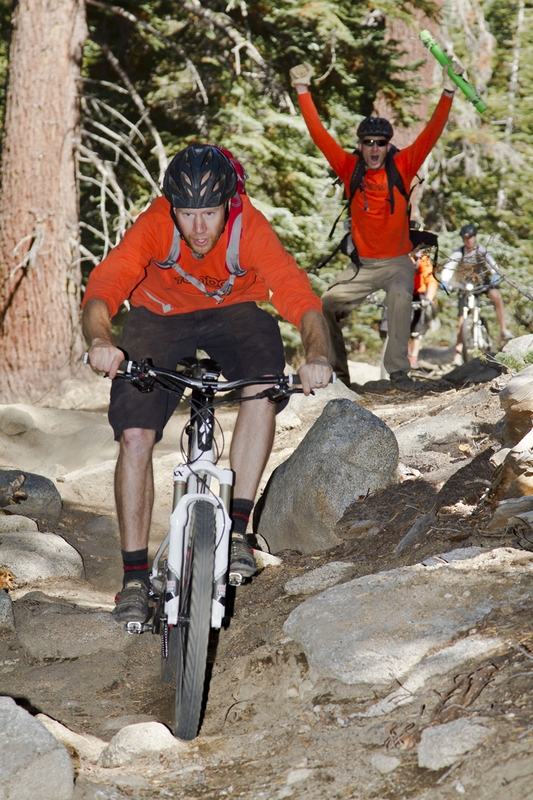 The Forest Service soon changed its stance toward mountain bikers. They began to recognize TAMBA as a resource group—a group who could be called upon to help with trail maintenance and Tahoe beautification. Budgets were tight, but mountain biking volunteers made it possible to maintain the character of Tahoe’s world-class trail system. Eventually the Forest Service put a stop to its plans to designate the mountains on the southern shore of Lake Tahoe a Wilderness area. As a result, Mr. Toads remained accessible for mountain biking usage and turned into a popular destination for bikers and hikers alike. Volunteers on a recent TAMBA trail build day (Ben Fish). Mr. Toads continues to change and evolve, and mountain bikers still play a key role in preserving the characteristic of its natural environment. 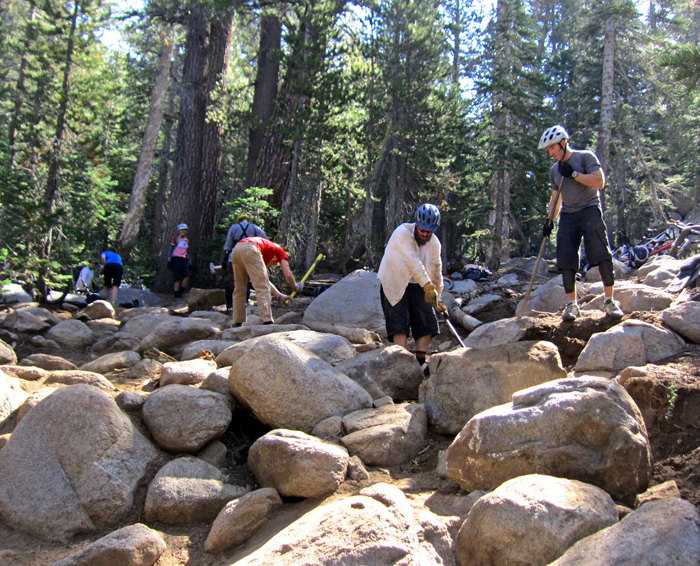 TAMBA’s volunteers haul rocks to fortify spots in the trail where ruts form. They remove logs to prevent riders from going around them, creating unwanted paths. TAMBA volunteers re-route certain spots to protect the water quality of Saxon Creek and the habitat of endangered animals such as the spotted owl and goshawks. Mr. Toad’s Wild Ride is now a key location where funds are raised to maintain Tahoe’s trail system at large. The mountain biking fundraising event, Rose to Toads, attracts over 200 riders every year and has raised thousands of dollars for trail maintenance and development. Mr. Toads continues to evolve and change. The changes it now experiences are no longer the result of cattle grazing activities or the whims of Mother Nature. 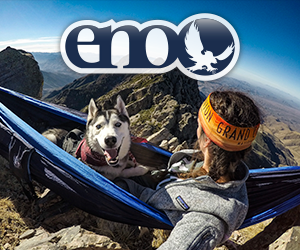 Rather, they are largely influenced by the needs and preferences of mountain bikers, hikers, and the recreational community at large. We can only speculate what types of changes future user groups will make. Perhaps the story of Mr. Toad’s Wild Ride will serve as an illustration of how people can successfully come together to help preserve and maintain important trail systems that give happiness to so many and inspire future generations of public lands volunteers. Staging for a TAMBA trail build day (Ben Fish). Ben Fish rides an old section of trail with a newly built rock trail tread. As the dirt trail erodes, rocks are used to fill in the ruts to “Keep Toads Wild” (Amy Fish). Test riding during a recent TAMBA trail build day (Dave Clock). Better than an amusement park ride, Max Fish navigates through big boulders during the Tahoe Mountain Bike Festival (Ben Fish). 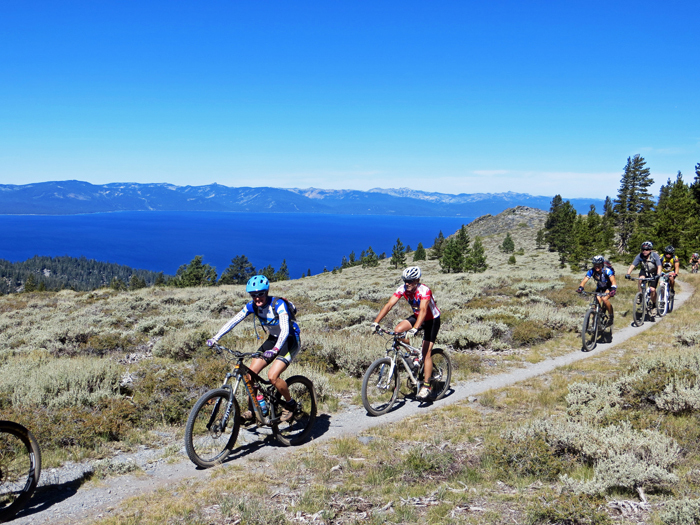 Riders on a section of the Tahoe Rim Trail during the annual TAMBA Rose to Toads ride (Ben Fish). All smiles for now, 25 miles into the annual Rose to Toads ride (Ben Fish).